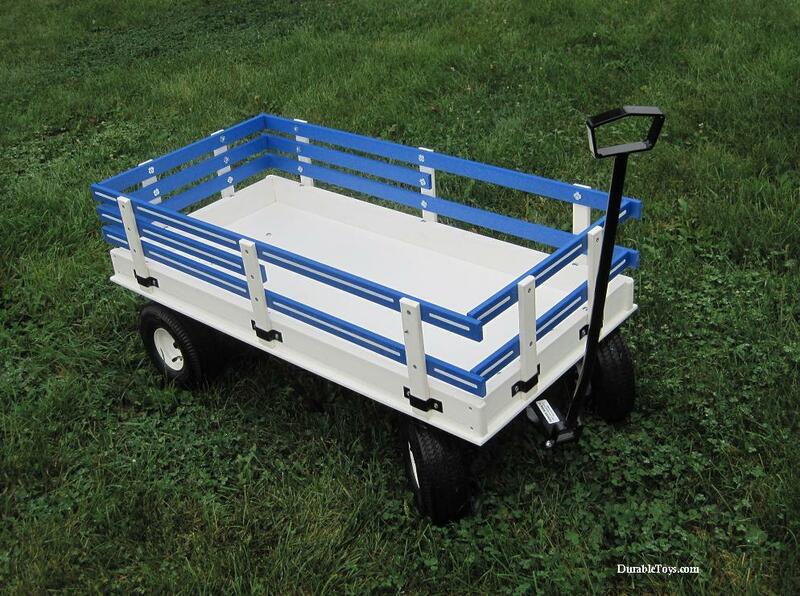 Amish Plastic Wagons are an Amish-built wagon option made of heavy-duty plastic. These plastic wagons resist the effects of sun and rain exposure. Hochstetler's unusual plastic wagons are made with "boards" of weatherproof recycled plastic for all parts of the wagon bed and racks. The colors penetrate the material, so these plastic wagons are great for heavy use because scratches hardly show up. The pinstriping is also unique, done with reflective white pavement marking paint with crystal grains. Extensive wagon color options, now including red, royal blue, aqua, dark green, lime green, green and yellow, orange, pink, purple and cherry wood brown. The saturated color provides a different look from painted racks. Hochstetler makes our only all-plastic beach wagon, a new option made specifically at the request of DurableToys.com customers. Our other shops make wagons with plastic beds, but with wooden side racks. Speedway Express also has three wagon models with plastic wagon beds (see below), and most Valley Road wagons are available with plastic wagon beds (see the Valley Road page).